Feedly has recently added some new interesting features to improve the way you save, read and share web content. With these new features, users will be able to create boards, highlight salient part of stories, and add notes. Feedly’s boards feature is similar to the one in Pinterest. Boards help you save and organize web content you come across online. You can easily create boards for different topics and start arranging your content accordingly. And if you work in teams, you can create Shared Team Boards where you and your teammates can save and view each others stored content. 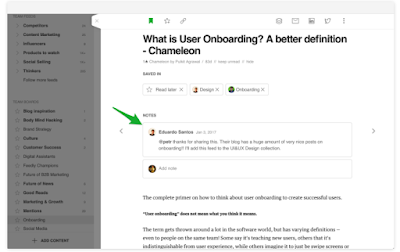 The boards feature is available for all Feedly plans (basic, pro, and teams).